TTC track staff have identified an urgent repair to the streetcar right-of-way on The Queensway at Sunnyside Avenue. A crew will be working starting tomorrow to repair the concrete and also conduct rail maintenance work. This work is expected to take 3 days to complete. • To maintain a safe work area, there will be a turning restriction (south-to-east left turn from Sunnyside to The Queensway). 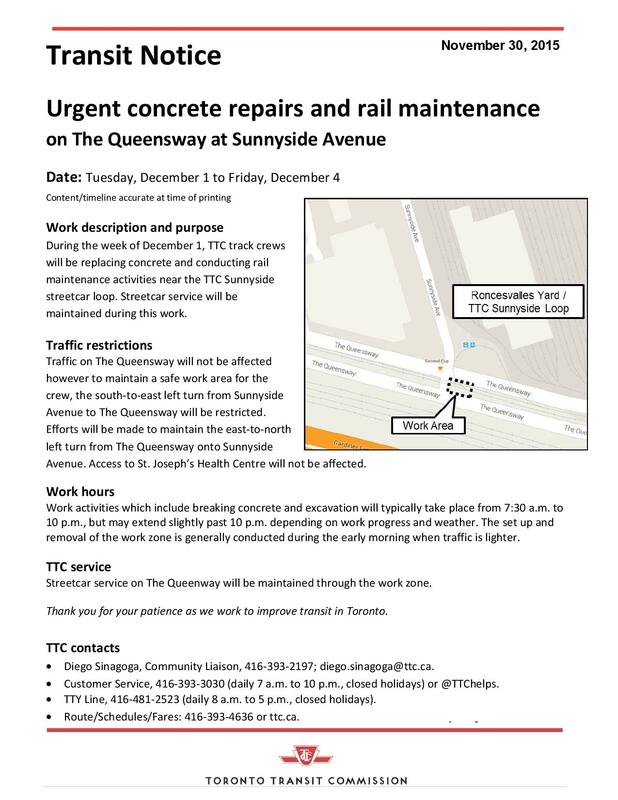 East-to-north turn from The Queensway to Sunnyside will be maintained as best as possible. • Streetcar service through the area should not be affected. The recent hate crimes targeting Muslims, especially our Muslim sisters, are unacceptable. We must recognize these acts as the hate crimes they are. We are unfortunately at a place where there are some in the world working to divide us, to make us fear each other. It is for this reason that it is more important than ever that we remain united. On Friday I signed a Statement of Unity signed by the Mayor, all Toronto City Councillors, all Toronto District School Board Trustees and all Toronto Catholic District School Board Trustees. This is the first time we have all stood united. I’d like you to join us and add your name, then share this commitment to remain united against Islamophobia, xenophobia, racism, and hate. See the statement & sign on here:http://you.leadnow.ca/petitions/statement-of-unity. Great article on some of our green spaces in Ward 14. Time: Panel discussion from 7 to 8:30 p.m.; interactive activities begin at 6:30 p.m. Location: Council chamber, Scarborough Civic Centre, 150 Borough Dr. The City of Toronto will host the third event in the TalkTransformation! series at the Scarborough Civic Centre on November 26, with the focus on generating ideas to reduce emissions from transportation – the largest source of greenhouse gas emissions in Toronto. Matt Elliott, urban affairs columnist with Metro Toronto newspaper, will moderate the panel discussion. Featured speakers/panelists are Marianne Hatzopoulou of the University of Toronto, Adam Arnold of UrbanTrans North America and City staff members Hilary Holden of City Planning and Ashley Curtis of Transportation Services. The TalkTransformation! series is part of TransformTO, an initiative to engage Toronto residents and businesses in imagining the transformative changes needed to reduce local greenhouse gas emissions by 80 per cent while at the same time improving public health and the local economy and reducing social inequalities. More information and public registration (space is limited) for the November 26 event are available at http://toronto.ca/transformto. 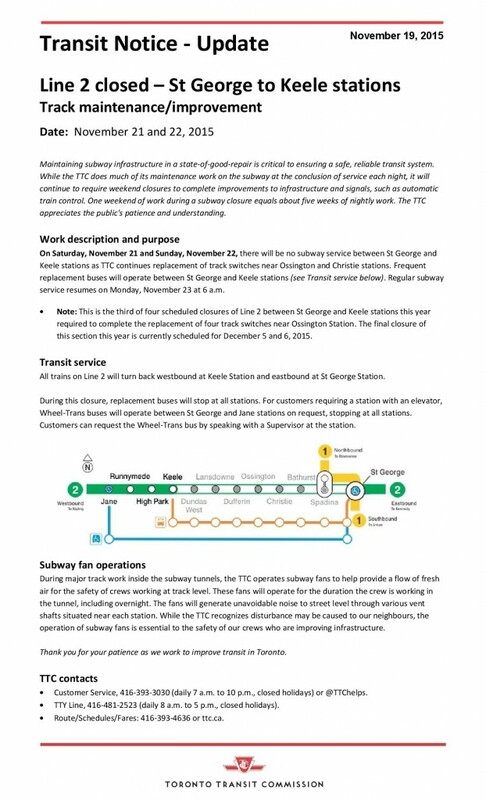 This weekend, Nov. 21-22, there will be no subway service on Line 2 between St George and Keele stations only as the TTC conducts maintenance work in the area, including replacing track switches near Ossington and Christie stations. Maintaining subway infrastructure in a state-of-good-repair is critical to ensuring a safe, reliable transit system. While the TTC does much of its maintenance work on the subway at the conclusion of service each night, it will continue to require weekend closures to complete improvements to infrastructure and signals, such as automatic train control. One more weekend subway closure is scheduled this year on Dec. 5-6, from St George to Keele stations. A frequent shuttle bus service will operate between St George and Keele stations. Christie Station will be closed, but all the other stations will be open for the purchase of fares, as well as for connecting bus and streetcar service. Wheel-Trans vehicles will be available for customers who require accessible transit. Customers can speak with any uniformed TTC employee at any station to make use of this service. Regular subway service will resume on Mon., Nov. 23 at 6 a.m. The TTC appreciates the public’s patience and understanding while it does this important work. Join participatory planning workshop to create a Parkdale Neighbourhood Plan! Parkdale is one of the few remaining socially, economically and culturally mixed neighbourhoods in downtown Toronto. However, Parkdale is changing rapidly under huge pressures from real estate reinvestment. This change raise a question of diversity, inclusivity and affordability, values that lie at the heart of Parkdale. This is why a collaborative group of community agencies, groups and residents have been initiating community-based planning initiative in Parkdale, called Parkdale Community Economic Development Planning project. The goal of the project is to develop a Neighbourhood Plan for Parkdale, one that can help guide neighbourhood change according to long-term community needs and goals for building shared community wealth. PCED team has been conducting an extensive community engagement and consultation process – such as Parkdale Wellbeing Indicator workshop and Community Needs & Assets Mapping workshop. These participatory processes have helped us hear and identify key visions, priorities, and directions for the future of Parkdale that we want to create together. Please join us to be part of community-based planning process in Parkdale! We would like to hear new ideas and good practices that you have for Parkdale. We will also discuss ideas for emerging initiatives such as Parkdale Neighbourhood Land Trust, Co-op Cred program, and others. We have the following three dates and times for this round of participatory workshop. The Toronto Renovates Homeowners Program has resumed accepting Assessment Request forms. The Toronto Renovates Homeowners Program offers federal/provincial funding for lower-income seniors and people with a disability who wish to make health and safety repairs or accessibility modifications to their homes. Once a request form has been approved, a Toronto Renovates program officer will contact you to arrange an appointment. You can download the form or contact the Affordable Housing Office at 416-397-4169 to have one mailed to you.